Die casting is a manufacturing process in which molten metal is poured into steel moulds. Moreover, the moulds are created using steel and are bespoke to each customers part design. Therefore, ensuring that each component is manufactured with accuracy and repeatability. Aluminium, zinc, and magnesium are the most commonly used die casting alloys. The three main die casting alloys include zinc, aluminium, and magnesium. However, Goudsmit UK only manufacture zinc and aluminium die castings. They are normally non-ferrous, and their mechanical properties vary greatly to fit almost every type of application. Separately, each die cast alloy offers distinct advantages that the other may not offer. Therefore, ensuring that customers are not limited when it comes to choosing the right metal for their parts. Depending on the application, there are two types of pressure die casting, high pressure and low pressure die casting. High pressure castings are essential for castings that require tight tolerance and detailed geometry. While, low pressure die casting is commonly used for larger and non-critical parts. The only difference between the two processes is the method being used to inject molten metal into the die. The hot-chamber process is appropriate for zinc and other low melting point alloys that does not affect and erode metal pots cylinders and plungers. While steel castings along with aluminium and copper-based alloys are produced by the cold chamber process. High quality castings, of aluminium and other low melting point alloys are usually produced through this process. Firstly, a metal die is positioned above a sealed furnace containing molten metal. Once in place, a refractory-lined riser extends from the bottom of the die into the molten metal. Low pressure air is then introduced into the furnace. Causing the molten metal to rise up through the tube, entering the die cavity with low turbulence. Once the metal hardens, the air pressure is released, and the riser tube falls back into the furnace. Once cooled, the die is opened, and the casting removed. This needs to be worked on with us from the beginning. Normally there is quite a lot of metal which must be removed from the part after casting, influencing cost. The amount of gating and venting will depend on the complexity of the part and any hard to cast features. The clipping tool will remove all excess metal from the part and is either mechanical or hydraulic. The tool will try and remove the feed and vent system as cleanly as possible, however this is not always the case and is dependent on the geometry of the part. Also, the alloys have a crystalline structure and thus do not break as cleanly as say mild steel would, so there will be witness left. A solution is to leave some witness on the part after clipping and then CNC the part to optimise removal. At this point we can begin to cover up some of the evidence left by the process up until now. Some of the residual flash can be removed as can the evidence of split lines and ejector pin marks. Although not removed completely they can be much reduced. Shot blasting, bead blasting and vibratory tumbling are common techniques Goudsmit UK employs to modify the finish of the casting post cast. This can be several different coatings from metal to organic. Generally, die castings do not anodise well but chromate conversions can be applied. However, powder coat can form a very good cosmetic finish changing both colour and hiding some of the process witness. Finally, die castings do age with time and can become darker due to oxidation, therefore it is important to opt for a cosmetic finish of some description. 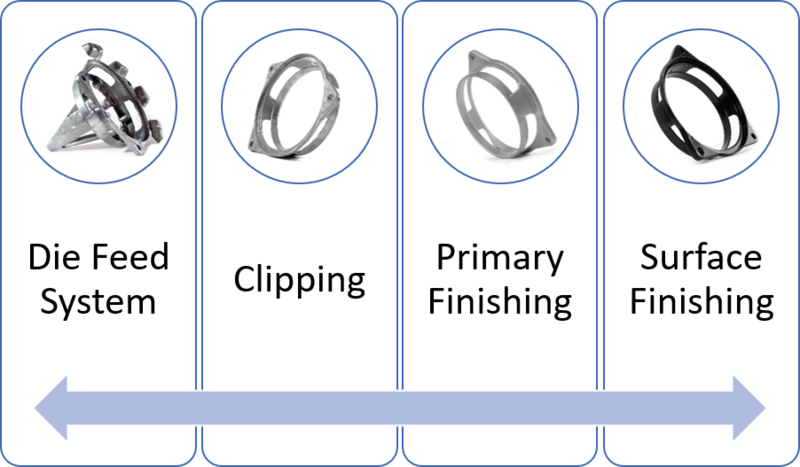 The diagram below shows the same part working through the 4 stages, from die feed system through to surface finishing. Goudsmit UK is a global manufacturer of die cast precision components. Our engineers offer design solutions for a variety of industries including aerospace, automotive, renewable energy, and more. Qualified to ISO 9001, AS 9100 and TS 16949, we’re the perfect partner for you. Contact us today for more information at info@goudsmit.co.uk. Or you can also speak to a member of our team call us on +44 (0) 2890 271 001. For more information on our die casting products visit our webpage or our brochure.